I hadn’t before realized the rage and exuberance of this writer, the gambler in the cassock, the voracity for all things human and the will to write his appetites on stone and oiler the tablets to a void and hope that the void can weep. 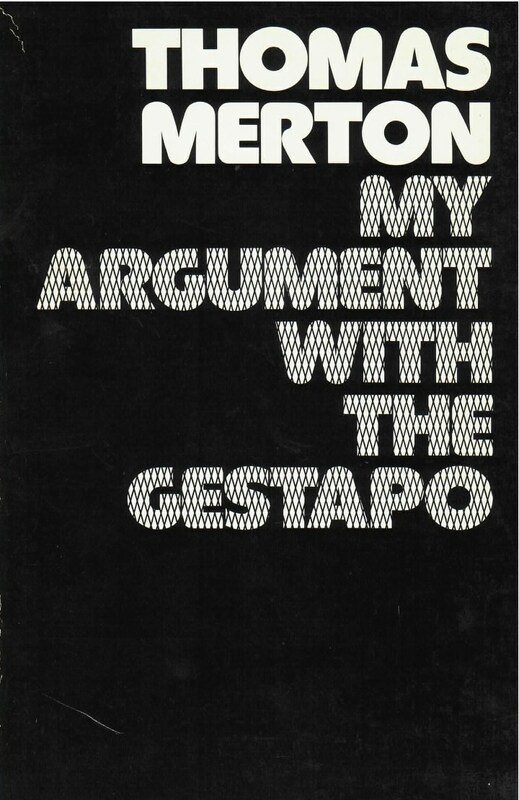 Of the full-length prose works that Thomas Merton wrote before he entered the Cistercian Order in 1941, only My Argument with the Gestapo has survived––perhaps in part because it was a book that Merton never ceased wanting to see in print. Although it first appeared after his death in 1968, he had arranged for its publication, written a foreword for it, and was delighted with the prospect of its at last becoming a part of his published works. My Argument with the Gestapo tells of the adventures of a young man, clearly identified by the name Thomas Merton, who travels from America to Europe to report on the war with Germany from the viewpoint of a poet. He hates the war, yet is driven to come to terms with it. There is a pervading sense of dreamworld or hallucination, heightened by the device of passages written in a macaronic language, invented from multilingual roots, to satirize and parody political propaganda speeches dealing with the war. A work of imagination (Merton did not in fact return to England after the start of World War II in Europe), it nevertheless contains much that is autobiographical and revealing of the young Merton. Most clearly visible are the seeds of his never-forsaken concern with peace and nonviolence and his abhorrence of war. Indeed, his outspoken criticism of Britain at a time when all the emphasis was on ’’the brave little island standing alone” foreshadows his devotion to truth as he saw it, no matter what the cost. And students of Merton will find scenes in the book that are straight autobiography, amplifying and perhaps filling in gaps in what later was to be the beginning of Merton’s great literary success, The Seven Storey Mountain (1948).